U.S. Labor Force: Where Have All the Workers Gone? It’s not supposed to be this way. As the U.S. economy recovers, hirings increase and people are encouraged to look for jobs again. Instead, the ratio of the adult population with jobs, or looking for one—what’s called the labor force participation rate—has been falling, standing at 62.9 percent in July 2014 (Figure 1). This represents a 3 percentage point decline since the Great Recession and the lowest rate since 1978. What is more remarkable is that fully one-half of the gains in participation rates between 1960 and 2000—those driven by sweeping social changes such as the post-war baby boom and the entry of women into the work force—have been reversed in the last six years. The equivalent of 7.5 million workers have been lost from the U.S. labor force. The dynamics of the U.S. labor market is perhaps the most critical—and uncertain—issue in economics today. It matters for two crucial reasons. First, the future size of the labor force will be central in determining the pace of U.S. economic growth over the medium term. Second, the extent to which the recent declines in participation rates are reversible will be the principal factor in deciding future wage and price inflation and, as a result, the timing and pace at which the Fed raises interest rates. Even before the Great Recession, worker participation had been declining. The “golden” era was 1960–1990, when participation rates increased from 60 to 66 percent. This reflected the baby boom generation reaching adulthood and women becoming more fully represented in the workforce. But this boost to the size of the labor force started to fade in the 1990s as the baby boom generation started retiring and participation rates for women began declining. Indeed, since the bursting of the dotcom bubble and the 2001 recession, the labor force participation rate has continued to fall. A mixture of factors is behind the decline. Structural changes, mostly linked to population aging, have been an important part of the downtrend. However, cyclical factors related to the availability of jobs and wage dynamics have also been important, particularly following the Great Recession. Our recent study points to aging being responsible for around 50 percent of the decline in participation since the Great Recession, while cyclical forces account for a further 30–40 percent. The remainder of the post-2007 decline reflects various other forces at work. For example, there has been a significant decline in youth participation. This has been mainly driven not, as some have conjectured, by an increase in college enrollment but, rather, a decline in the number of those students who are also working. In addition, rising applications for disability insurance have played a role. Demographics have meant more of the population is in the over-50s age group where the incidence of disability insurance is highest. Adding to this was the upward spike in applications following the Great Recession. Importantly, even those eventually denied benefits exited the labor force while their application was still pending. Using detailed state level data, our analysis suggests that up to one-third of the post-2007 decline in participation rates is reversible. Over the next few years, this should mean a temporary respite in participation with workers (about 2 million) coming back into the labor market as job prospects improve. However, by 2017 participation rates should again start to decline as the underlying forces of population aging begin to dominate and more-than-offset the cyclical bounce back. Despite the recovery so far, the U.S. labor market remains far from normal. 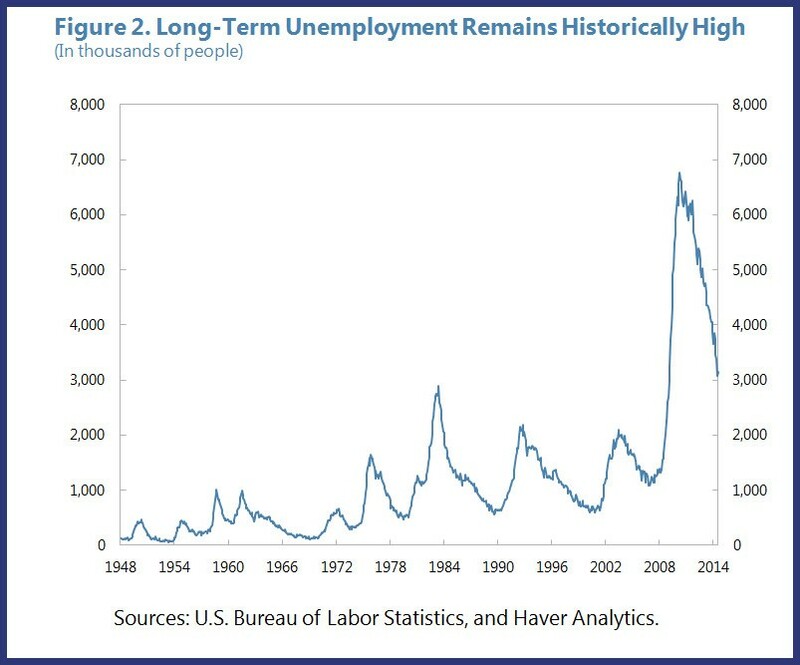 The numbers of long-term unemployed are still higher than at any previous peak since World War II (Figure 2). 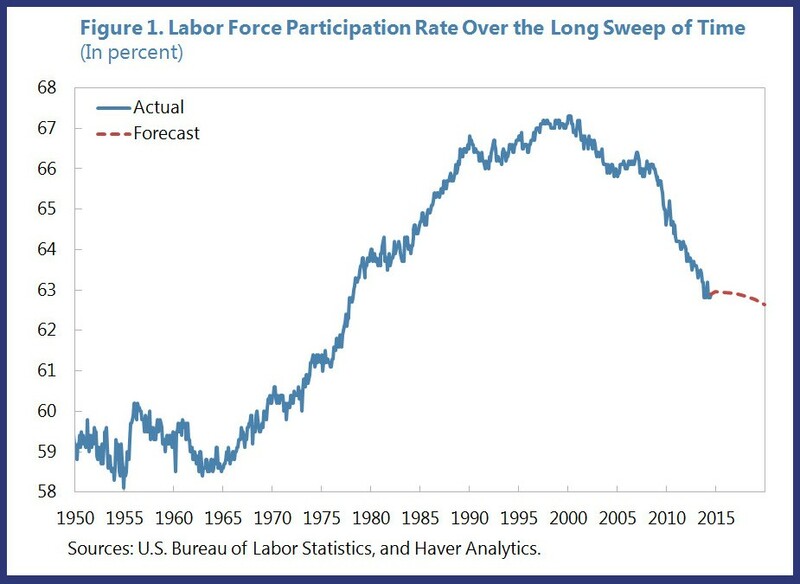 And a sizable “participation gap”—the difference between the trend participation rate and the actual participation rate—has created other forms of labor market slack, which is when there are more potential workers than jobs (Figure 3). 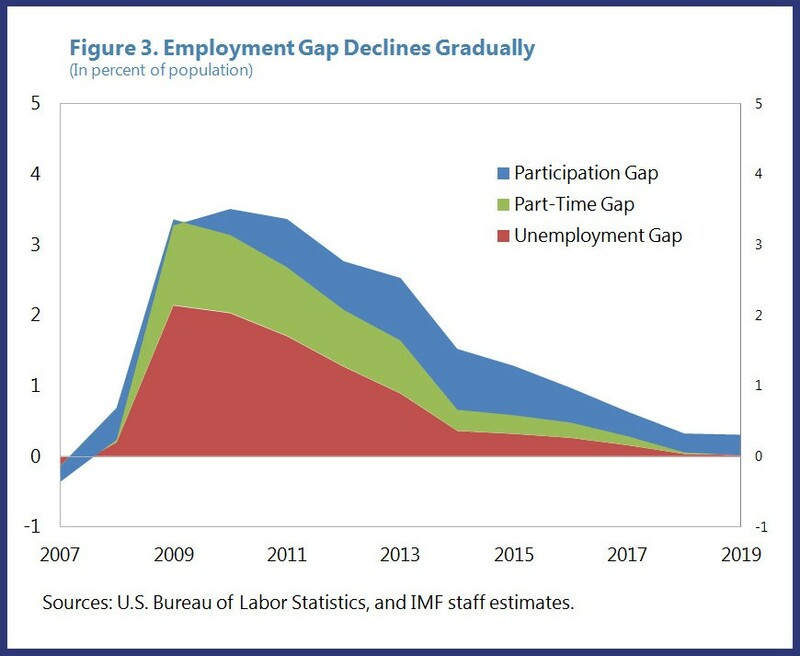 Hence, policies in the coming years should focus on maximizing the potential of the U.S. labor market. Demographics cannot be reversed but progress can still be made. First, economic policies that get the country growing again will help strengthen the labor market, raise wages, and bring people back into the labor force. Labor supply measures would also help and pay-off over the long haul by boosting potential growth. Key measures include enhancing training and job search assistance programs, so as to raise human capital and productivity. Better family benefits—including more affordable childcare—would allow both parents to continue working and help reverse the downward trend in female labor force participation rates. Finally, immigration reform ought to be part of the solution. To support its aging population, the U.S. could provide greater visa opportunities for high-skilled immigrants. This would not only help boost the size and productivity of the labor force, but also likely improve the government’s fiscal position. One Response to "U.S. Labor Force: Where Have All the Workers Gone?" This is generally sensible. I have been puzzled by the degree of concern over age-related labor force shrinkage. There may be transition bumps, but I assume that market forces will simply increase the productivity, and raise the pay, of the active labor force. No inherent reason why the economy should shrink. Since the aged will need (mostly high-end) services, govt-mediated transfers will probably have to increase, but those funds will go to support the workers providing the services..